One of the major tasks for an association is to communicate with its members and other reference groups. Smartphones and the mobile internet are changing the communication habits of business target groups around the globe. Mobile is eating the world. And especially communication and real time collaboration. Due to that, there are new challenges that associations encounter, but also new opportunities. Because of the lack of resources, the right choice of tools becomes not only more important but also more demanding. Next to your own website, social media platforms has to be served with often small teams. Those platforms can help to communicate your position to the outside world. But those platforms are not very efficient as a lasting and permanent communication channel to your most important users – your own members. The question that follows: How can associations establish a lasting, mobile communication channel with members and stakeholders, while strengthening their own brand and managing the existing means at the same time? Only sending email newsletters and printed letters cannot not be the answer in times of WhatsApp, Slack & Co.
tchop™ is combining the idea of “Content Curation” with the potential of efficient “Content Creation”. Own and external contents can be imported, edited and published on every device. With a few clicks and an utmost of automation. tchop™ empowers you to create a premium place on the smartphone, where all your members, employees and stakeholders can find relevant and up to date information in a convincing way. Without creating more work for your own team. Without any IT deployment or integration needed. Native apps are creating a sustainable mobile communication channel with your colleagues, members as well as within dedicated work- and reference groups. No website can ever do this. Performance, user experience and usablity of native apps are always superior to a mobile website. There is a good reason, why users spend 90% of their time in apps. tchop™ is offering a true full service, which means you will not require any technical knowledge or resources. You can focus on content, communication, and your target groups. No doubt: real-time communication in mobile chat apps becomes a kind of standard for modern teams and workgroups. Facebook Messenger, WhatsApp etc. are perfect for private communication, but you cannot recommend one of those consumer tools for confidential business communication within your association. A solution like Slack sounds good, but it does not fulfill the high standards of the european privacy guidelines. And for many users it turns out to be too complex, since they are used to Whats App from their private communication. tchop™ is giving you the opportunity to have a branded real-time messenger with the full feature set that your users expect. A chat app in your own look & feel. It is a safe an secure platform which full fills the strictest privacy guidelines. All content data is yours. 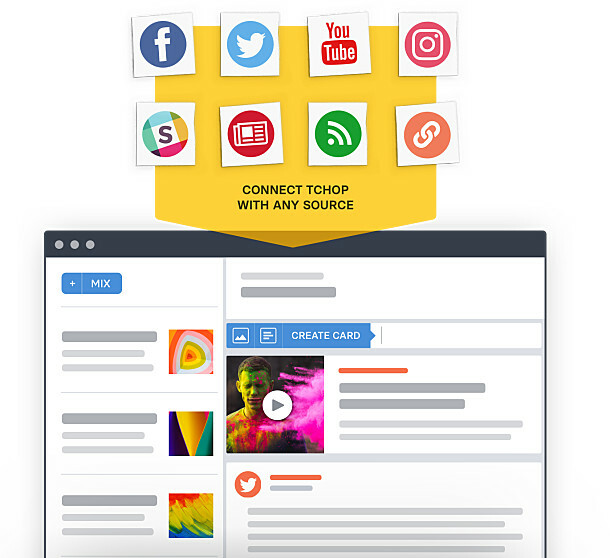 In comparison to private chat platforms, tchop™ gives you full control: you decide who can create and administrate groups, who can just just reading or who can write, what is published for the public and what stays confidential. You can organize everything smoothly over a dashboard. tchop™ makes creating those channels with own content and chat groups incredibly simple. The app administrates those itself and can be extended flexible and dynamic – without any further updates. You can start with one or two channels and expand the offering later anytime you want. As the first communication platform, tchop™ is combining safe real-time messaging with current content – in a mobile app in the look & feel of your association. The possibility to integrate existing feeds, systems and sources with a few clicks and a high degree of automation, enables you to create one place to curate and aggregate daily content for the right target groups. The whole platform is easy to use, also for small teams! You can jump right into it and you will not need any technical know how or resources. Focus on your association work and communication – we do the rest!